I’ve been working on a list of articles for a while now, and was pretty set on them before the snow hit Britain. Now I’m considering to change it around a bit and work on a Winters addition to my magazine. I possibly will still do some of the articles I planned on doing, but more as an example of what other issues would contain. It’s led me to think this magazine will have 4 annual issues, summer, spring, autumn and winter – and the example magazine that I will take to print will be the winter issue (however this is still just an idea). Over the next few weeks I will be posting page ideas as separate blog posts, rather than creating a huge blog post now that’s cluttered and difficult to follow, so look out for that. They’ll contain example images and text, all of which will be written and photographed/designed by myself (unless otherwise stated). I’m not going to bluff, I’m quite uneducated in the way of binding. 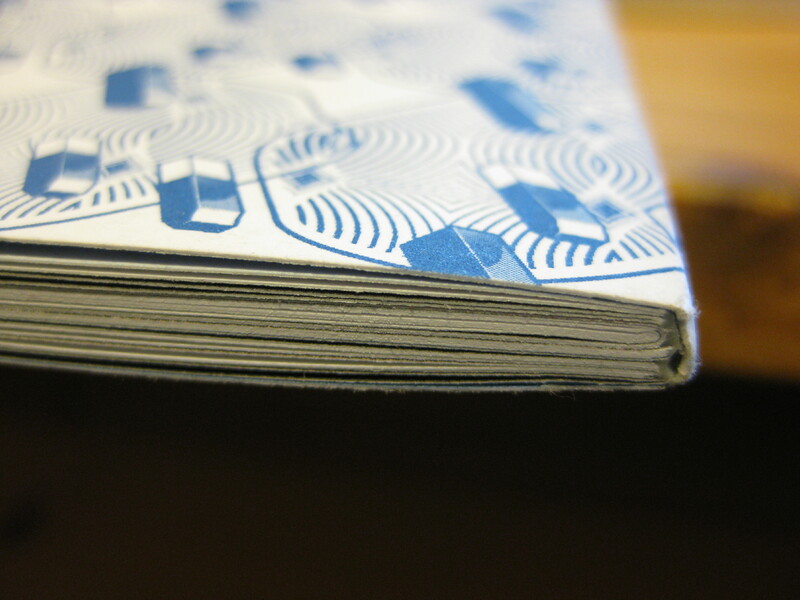 However, I’ve known in my head how I wanted it to look since quite early on in the project, but knowing how to word this is probably where I begin to go wrong… After researching, perfect bound is what I believe I want, it’s the neatness of this binding that always attracts me to magazines that use it. 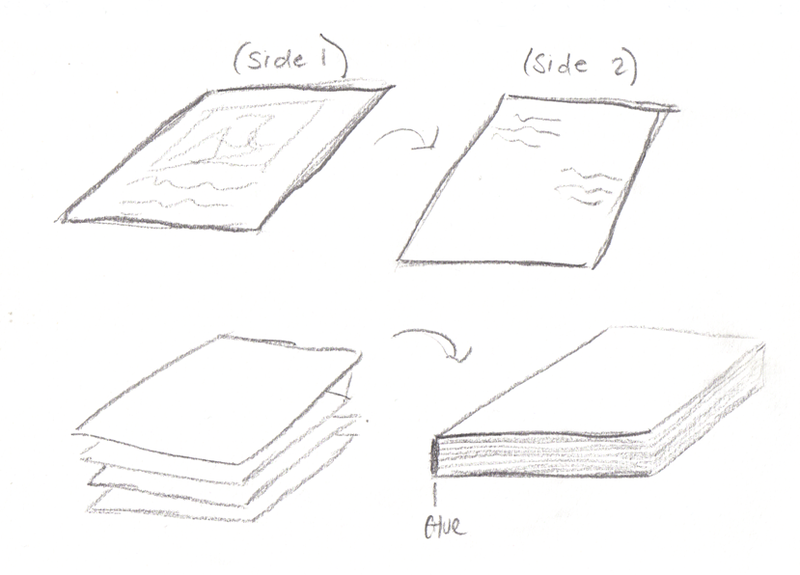 The photograph below is one I took as an example of this binding method. 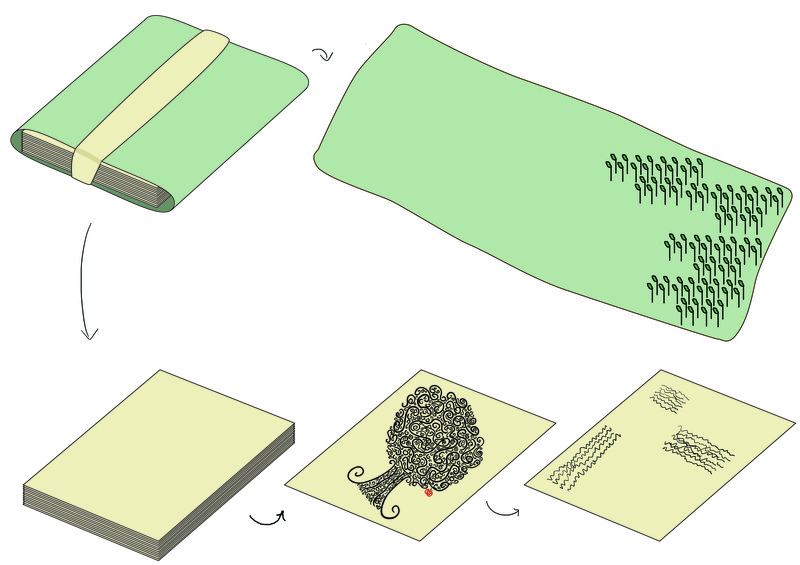 The main change to the design is it’s now a narrow box, with the base containing the home-made paper and cress seeds. When watered it’ll grow from the base, where the magazine was previously snugly fitted. A new advantage of the design is it’s transportation and display will be much cleaner, and some sort of ‘blurb’ could be added to one of the side. One last thing, I’m still not sure on the size of the book. I know it’ll be smaller than A4 but I’m unsure whether it’ll be vertical, horizontal or a square. I’m not too worried about this at the moment because I want to get a lot of my content sorted before I put it all together and decide on formats and styling. Well, that’s all for now! It’s taken me two days to get all this together, and I feel it’ll bring me great progress over the next week. 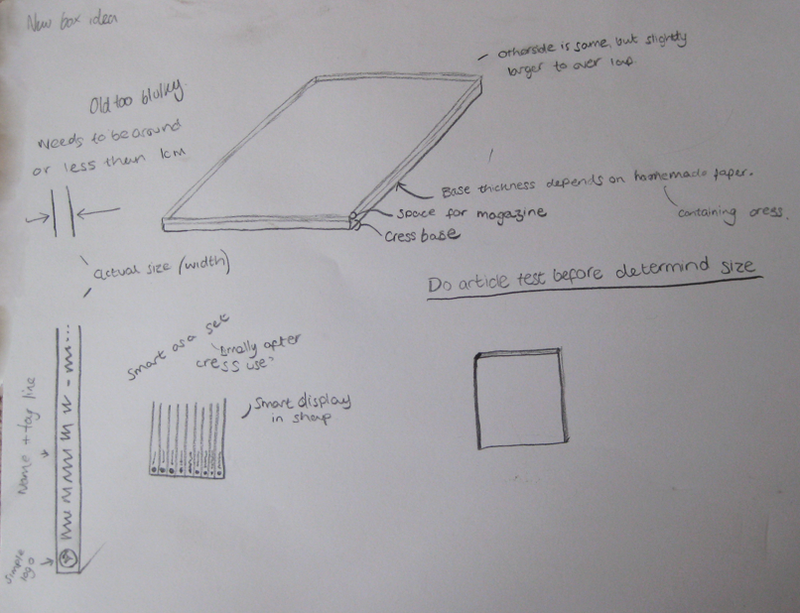 Over a week ago now, I thought I should delve into designing, seeing all I’ve done recently is research! So that afternoon/evening I worked on a mix media ‘rainy day’ page. 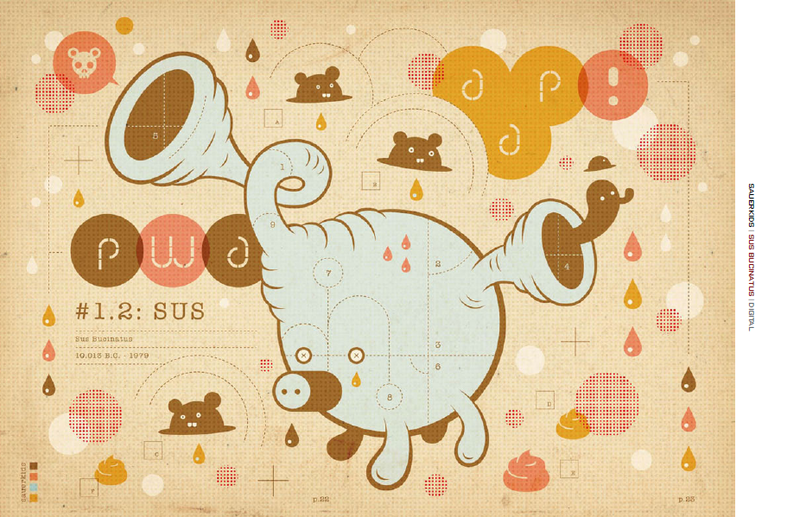 Mixing photography, illustration and laser cutting. I did a bit of designing which is also shown below, but how I came to thus design was mainly through a random idea, then little bits of trial and error. 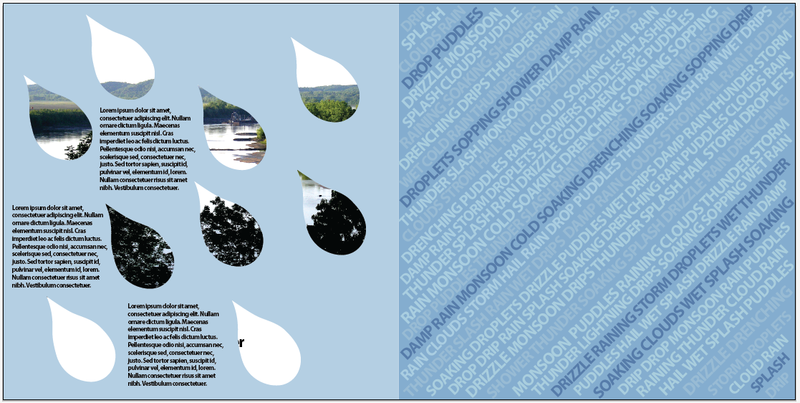 The above rain drop’s are actually holes in the page, and the blue shown is from the next turned over page shown below. 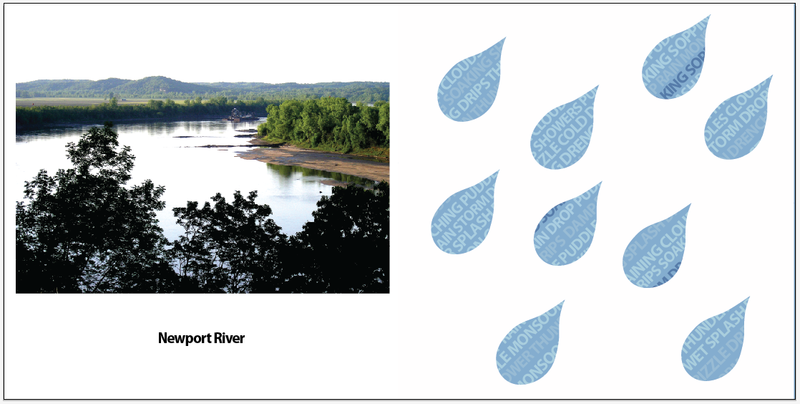 The rain drop holes now show parts of the previous page, and text is filled in within the gaps using a grid form. If you’ve been keeping up to date with my project posts, you can tell that this type of page isn’t correct for my new design. I now have a magazine that is created by a lot of individual sheets of different types of paper, so folding etc isn’t a necessity. I still wish to include this design onto my new pages, as I like the mix media approach – so look out for a post that will include an updated version of this design. In my head there are two main styles I can choose between. I could choose a very fussy and full page, however, while typing this I have noticed I’ve used a negative term ‘fussy’ to describe this style, which is making me think I should stick with clean and simple design. But what I want is a challenge, something difficult. 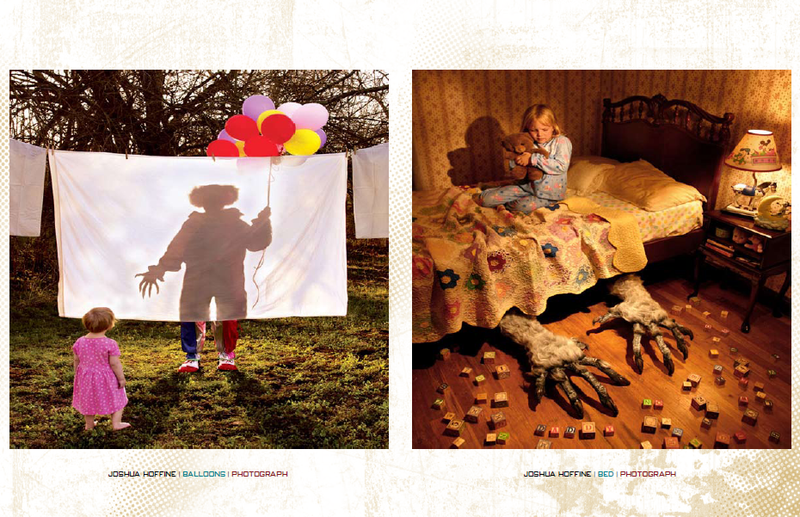 Below is a couple of scanned pages of Photographer magazine – the longest running photography magazine. It recently had a re-make, and the new style is very clean and crisp, with full page photography and smart black and white articles. At first glance I really liked the styling of this magazine – clean, cut and to the point. But then I realised it wasn’t inviting enough for me to actually read any of the information, I want to see things in image form, pictures that will make the feel the same as some of the photographers and illustrators I have previously researched. 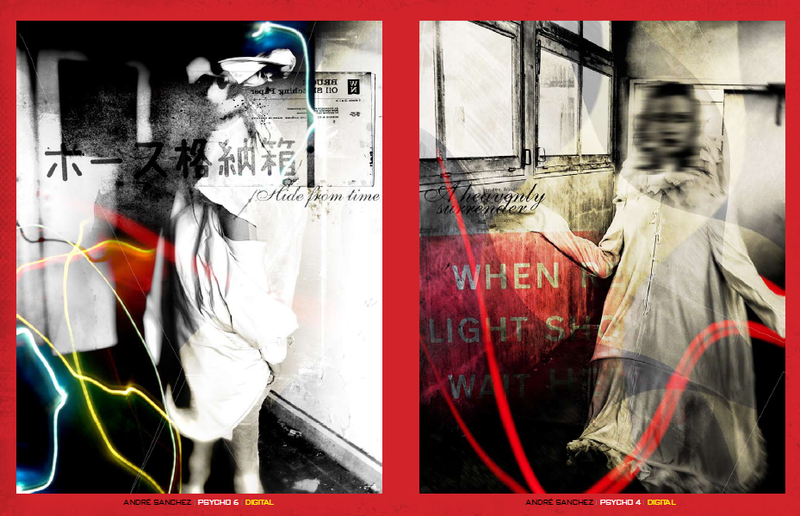 Below are screen shots of ‘Proteus Mag‘ an online Art and Design magazine. 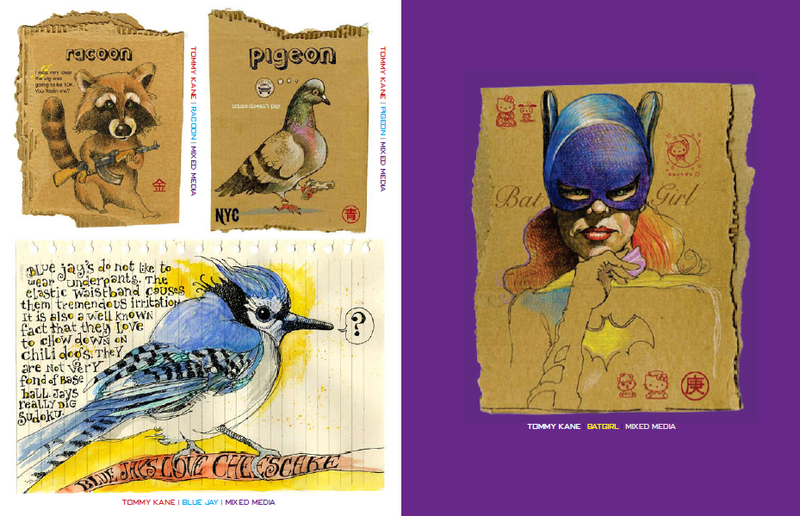 It mixed both styles together by having the front pages and content pages very full and artistic using digital artwork to represent screen printing etc. Where as on the main content pages they’re often quite simple and minimal, only showing the image and a small caption. Sometimes the background colour of the page is a strong contrasting colour which adds more character with the book, and keeps in with its creative side. 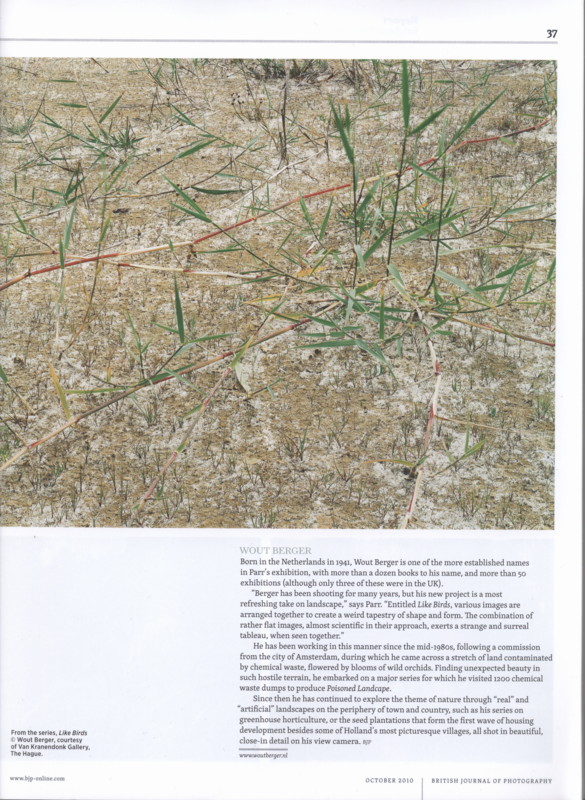 There’s minimal text within this magazine, and it’s solely aimed at viewing the images. This isn’t what I want, but I’m glad of this, as I hate to seem like I was just copying Proteus. I really like the Magazine’s design and style. Something along these lines would be perfect for my magazine, and it would also give me the chance to experiment with more than just photography. I felt that lots of different art mediums wouldn’t work together in a magazine, but after more research I’ve found they actually flow quite well! I really feel I’ve hit through my design blank I had! Now to get onto the book design. And so my project begins! Well, truth to be told it started a long time ago, but sadly my poor time management means that I’ve enjoyed creating posts for this blogs much more than sitting down to actually think about my Magawebzine project. I’ve been doing a fair bit of mind-mapping recently, trying to work out my magazine topic, concept and other design aspects, basically just making a start. First things first, discovering my two topics I want to use for my magazine. I knew I wanted the main focus to be on photography as that is my main interest, however choosing a suitable partner for this topic proved difficult at first. I didn’t want a completely random topic that wouldn’t fit in, I wanted something that would work well with it. Landscape, animals, and inset photography is something that I have naturally fallen into throughout my years of taking photographs. This is why I chose to focus my magazine on Photography and Geography. Pictured below is my first mind map (click it to get the full view) I did this a while ago, trying to work out where my topics could take me. 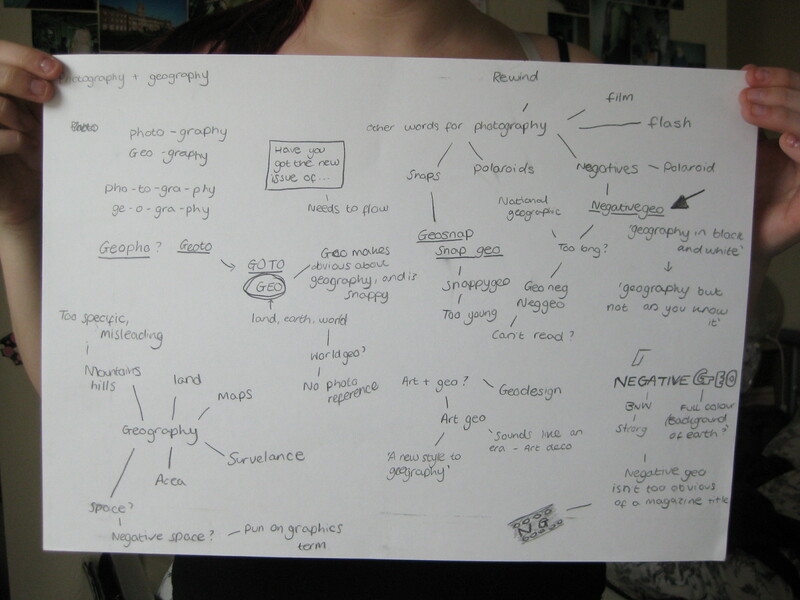 What I got out of it was a number of different article ideas and that I wanted to focus around more local geography than worldwide (this was also because I wanted to make sure I steered clear of copying National Geographic). 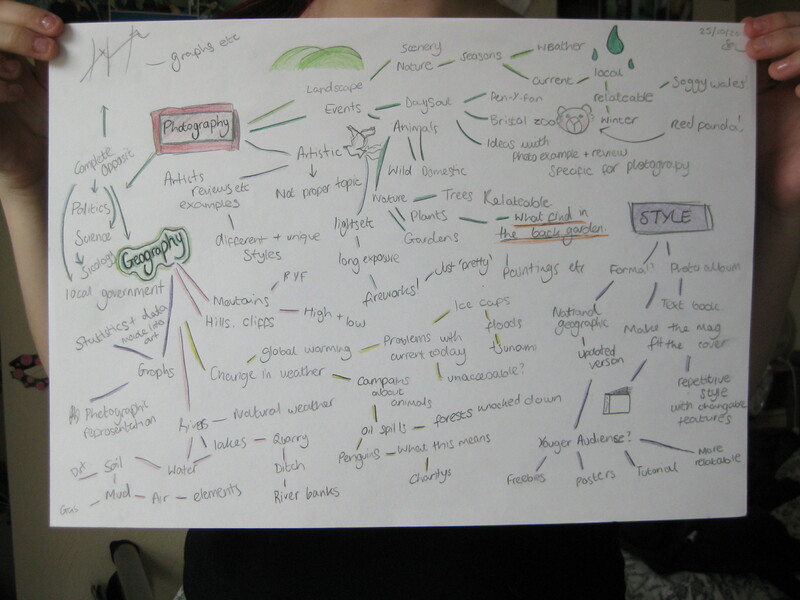 Happy with this start, I decided to delve further into ideas using more mind maps. 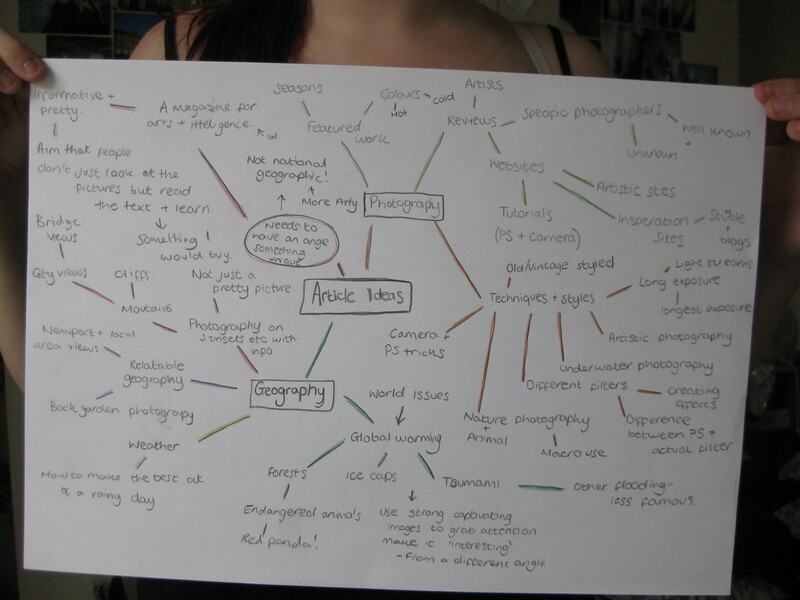 The following image is of a mind map I created to help decide what type of articles I wanted to feature in my magazine. 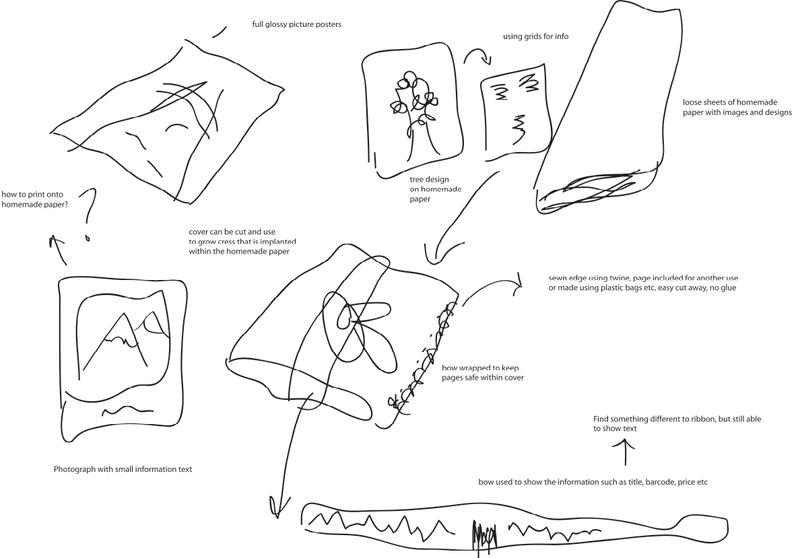 I was still working on concept, I didn’t want to design the main frame without being set on what style I wanted. Happy with this, I’ve selected a number of the ideas I’ve come up with and will be posting a finalised list soon with some examples of the imagery. The main theme of my magazine will be local photography, so I’ll use Newport (where I’m currently living for university) as a main topic. It’s not the most picturesque place, which is why I like it – it’s a challenge. It’ll be interesting to see what images I can create from this rather dreary city. Including facts, tutorials, and art reviews along the way. The name of my new magazine, finally I feel like I’m getting something. With a strong mind of articles and a name, I feel I’m on the right path to creating a good design magazine! Well, that’s all for now. I did all this a week and a bit ago. As I said I’m a little behind on the design side of the book. I need a gimic for it, something original to mae my design stand out. That’s the next hurdle. 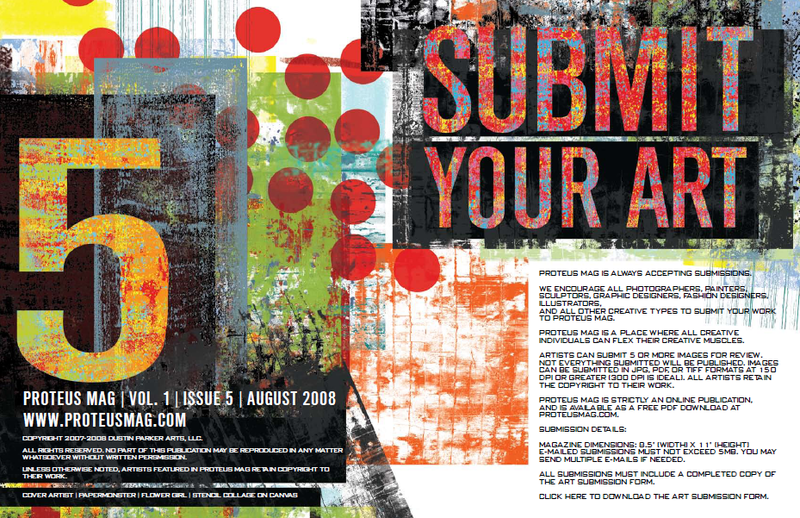 So mean while expect more artist research, news on my ‘Artists Proposal’, and further design work on my magazine. For a first basic project designed to get our interests up in our subject was to research the broad subject of ‘magazines’ on Wikipedia. This is for our first module called ‘Webmagezine’ which I’m only assuming will incorporate a magazine with a website, but we’ll be receiving further information next lecture. The article ‘Magazines’ on Wikipedia is surprisingly short as there are a lot of sub sections within the article to make it easier to read. These sections include a full article on the history of magazines, more on different publications and a long list of different specific magazine topics such as music, art, computer etc. There is a section of basic information for general magazines which explains the different types of distributions, categories, and publications. When a magazine is published to a paid audience. When a magazine is distributed for free. When a magazine is distributed to only those who qualify, eg. 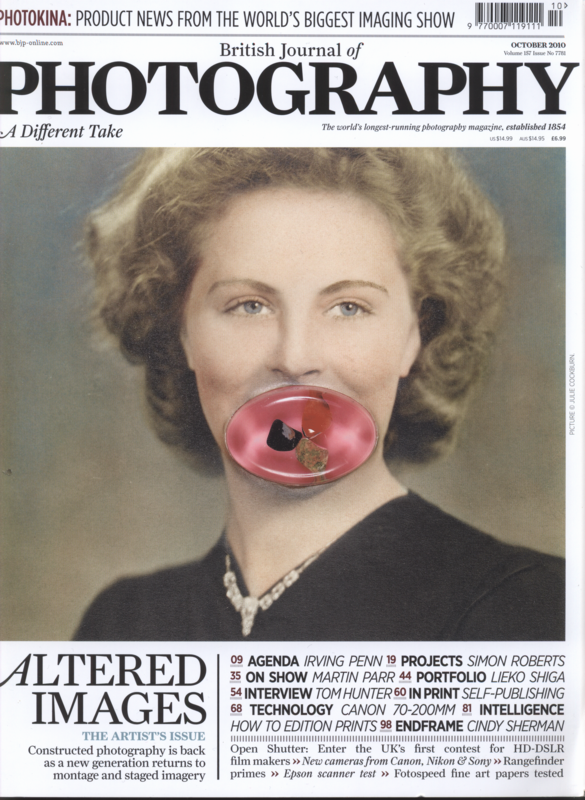 an insider magazine or industry-based magazine. The article also explains about publishing schedules for different magazines, and explains that for very specific titles such as ‘Cat Fancy’ may be published less frequently, such as monthly, bimonthly or quarterly. However, magazines with more broad subjects such as News or Entertainment will be published daily, weekly or bi-weekly, all depending on how quickly the content can be gathered, written, and published.